EPHRATA (CelebrityAccess) – Planned upgrades at the Gorge Amphitheatre may be pushed back to 2016 after general manager Danny Wilde said they plan on prioritizing building a security fence, studying traffic concerns and keeping neighbors happy over expansion plans. Wilde's comments came during a meeting with county commissioners, local fire departments, sheriff's office, planning director, and health officials over signing a concert management agreement with Live Nation for 2015, the Columbia Basin Herald reported. 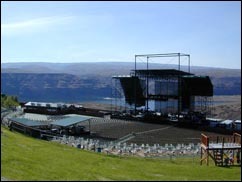 Live Nation had sought a zoning change in March, 2014, seeking to make The Gorge into a master planned resort. Grant County signed off on the plan in August, despite strong public discontent with the plan. Proposed upgrades included 1,000 camping spaces, a café and bar, recreational improvements such as a volleyball court and outdoor cinema.